This generous three bedroom home is perfectly positioned on a large level, easy care block with good street frontage and appeal. Situated close to all amenities the home offers two generous, double aspect, living areas that are flooded with natural light. Neutral decor and a combination of new floating floors, carpet and tiles come together with ducted gas heating and a split system air conditioner to create a home with style and substance. The kitchen sits perfectly within the floorplan, while the skylight exudes natural light, the servery window and stainless freestanding cooker are a real feature that ensures practicality within the space. Generous cupboards for storage and work surfaces with easy clean laminex are also featured. The flow of the home is seamless with the bathroom, separate WC and laundry all located sensibly between the living and bedroom areas. Accessible from all areas of the home, the bathroom also enjoys a modern feel. Updated this year with new tiling, the light filled space features both a bath and shower plus vanity. The laundry includes a storage cupboard and extra bench space with access to the yard for added convenience. All three bedrooms are set side by side, one with a large built in robe, and all with brand new carpet. The large windows ensuring natural light and external vistas. 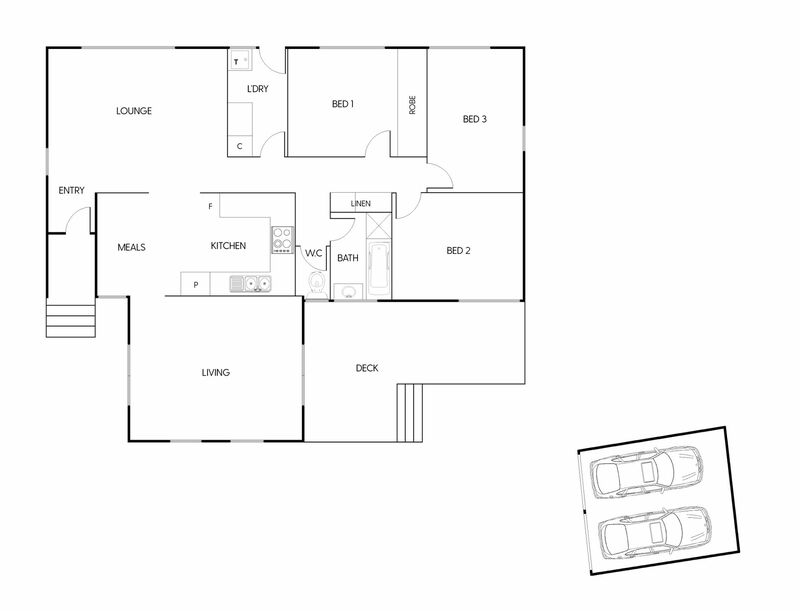 Generously proportioned, the bedrooms will allow you some flexibility with furniture placement and personal styling. With multiple entry and exit points to the home, the deck is sure to prove a popular living space. Accessible via the living room, the glass sliding doors invite the outside in and the elevated timber deck is the perfect place to soak in the sun or enjoy family gatherings or the privacy created by a lush green established hedge. Providing an ideal viewing spot, from here you can also keep a watchful eye on the easy care garden beyond. This lovely home, complete with double metal garage, has certainly been tastefully updated and modified and still provides possible opportunity to further enhance with plenty of land to play with. It’s superb location and access to abundant amenities including schools and public transport should make it an exciting buying opportunity and one that proves popular.